March 11th was a very special day for the IGLTA. For the first time we have hosted our own ITB booth. The most important travel trade show in the world, ITB is the place to meet the who's who in the travel industry. It has been a quite busy week for Tom Nibbio and myself since we arrived in Berlin at the beginning of the week. We are staying at the brand new Axel Hotel (photo right), the latest addition to the Catalonian hotel chain, owned by Juan Julia. We were warmly welcomed by Nicolas, the chain Brand Manager and for the whole hotel staff. The rooms are trendy and offer all the facilities the international gay & lesbian traveler expects from a 5 star hotel. A very nice spa centre with gym, sauna, steam room and Jacuzzi. It's restaurant and bar will certainly catch the attention of the Berliners and have all to become the place to socialize. We started the preparations to ITB with a meeting with Nicolas and Edwin, our new German Ambassador to finalize all the details of our presence and fine tune our appointments. We will be hosting a small cocktail party here at the Axel on tonight, Thursday, to introduce our German Ambassador to our members and to show them around the hotel. Well, so there we went on Tuesday to the huge fair grounds to check our stand and meet some of our members who were booth-sharing with us. The whole ITB area looked like a construction site and there were hundreds of people still building and decorating their booths... an we joined them with all the adrenaline and excitement on first-timers - In addition we took over thousand collaterals sent by our members who were participating in our brochure distribution . At the end of the day we were shattered made our way back to relax at the Jacuzzi and "cool down" in the sauna. Wednesday, after an invigorating and healthy breakfast buffet at Axel, we made our way back to ITB and it was like no construction had ever happened. The huge fair grounds were perfectly clean and tidy and all the brand new booths shining and smelling like a new car. We are located in the Hall 2.1, stand 247, at the Discovery America Pavilion. The staff there was again so helpful and friendly, accommodating all our wishes with a big smile. All our booth-sharing members we also thrilled to be part of the pioneering event and you will be glad to know that the IGLTA booth was one of the busiest booths in the huge Discovery America Pavilion. We had people from all branches of the tourism industry come and visit us and our members. We made many new friends and recruited many new members. After eight hours talking and hosting we let our hair down at the newly decorated Hotel Berlin Berlin, where we again welcomed all our members and friends in Berlin for our annual ITB party, organized by our board member Tom Boemkes. The hotel looks completely new and its large function facilities were a perfect background for our party. 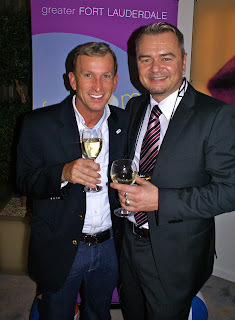 Greater Fort Lauderdale's CVB brought two stunning male models to welcome our guests and after the music, wine and good food did the rest to make sure that again, it was one of the highlights of the ITB and of the IGLTA worldwide calendar of events. I will keep you posted, so watch this space! Means you had a great time on March. I am sure you will always rejoice the fun.